There is no doubt that the interior designing and furnishing is a little costly affair. Even if it can be afforded by most of the home owners today, having prior ideas of interior design cost for a flat can help you in budgeting and making arrangements for funds easily and wisely. There are so many things that come into play, right from the kind of lifestyle and design theme you would like to go for to the brands, scope of work and experience of the turnkey interior designers. The cost of interior designing projects can vary widely on these factors. But then, it’s not that hard to get some ideas on tentative costs for interior design services, and I am happy to share it all with you today. What is the interior design cost in Kolkata for 1/2/3/4 BHK flat? Even if the interior design cost is directly related to the purpose, objective, kind of materials being used and overall scope of the work, I am happy to give you tentative budget ideas for 1 BHK to 4 BHK interior designing. Interior designing cost for a 1 BHK flat may cost you around Rs. 200000.00 to Rs. 400000.00. Similarly, the cost for interior designing of a 2 BHK flat can be around Rs. 350000.00 to Rs. 600000.00. Interior design cost for a 3BHK flat will be anywhere between Rs. 450000.00 to Rs. 800000.00. Tentative budget of around Rs. 550000.00 to Rs. 1000000.00 should be good enough for interior design of a 4 BHK flat. As you can see, the rates of interior designing services are in a range. Wondering why? Well that’s because of the variable factors that I was talking about. The actual cost for interior designing of your flat may vary based on your requirements, carpet area, brands and quality of materials you want to use and so on. But as you can see above, if you have a 1 BHK flat and you want to design and decorate it fully, then you should have a budget of Rs. 200000.00 or more. It should be good enough for you to design the bedroom, kitchen and a bit of décor elements in the living room. But if you want to decorate all of the rooms, including false ceiling, modular kitchen cabinets, one bed and cupboard in the bedroom, and basic house painting, then you have to tweak the budget and it may cost you up to Rs. 400000.00 to fully furnish your flat, using best of materials and with best craftsmanship and finish. So as you can see above, if you have the budget and you would like to fully utilize the space and design every part of your 1 BHK flat, then having a budget of Rs. 4 lakhs should be sufficient. But if you are on a budget, and want to get it done for less, then you can go for minimal work like designing the bedroom, modular kitchen, Tv unit and shoe cabinets and you can get it done for around Rs. 200000.00. Similarly, the interior design cost for 2/3/4 BHK can be adjusted according to your budget. Ideally, it is best to do the entire home interior designing and furnishings in one go. It is usually cost effective, and the most hassle free ways to get interior work done in a flat. Because once you move in, it’s going to be really hard to get the work started. You have to vacate the room, move in to a different room or may be a different house and so on. There are hassles attached to doing only a part of it. But, if you are seriously on a tight budget, then you can divide the work. The best thing about interior designing is, that you can do it all in one go, or you may even get it done in parts. So at first, you may like to do to the interior work in kitchen and Living room, and then you can decorate the bedroom and other areas later on. Now, that you have the idea of the costs of interior design of flats of different size, I am sure you would like to know about how to get the most of your budget, wont you? After paying the developers and registering the flat, arranging funds for interior design is not easy. But then, there are ways to get the most of your interior design budget. And if you want to get the most of your interior design budget, you should ideally hire a professionally experienced and equipped interior designer. Because hiring interior designers can help you get most of your budget and they’ll help you to avoid many mistakes, that you may end up making if you decide to do it on your own. If you plan to decorate and furnish your home without consulting a professional interior designer, you may end up in losses. When you go for furniture shopping or to shop other items for your new home, you may end up buying what is available in the store. You hardly pay attention to the layout, measurement, and color combination and even if you do, that is not enough. It’s natural to get carried away and make obsessive purchases. Imagine a situation, you have ordered a sofa, and when you get the delivery, it’s not fitting well. It may be too heavy and bulky for the space or may not fit well. If that’s the situation, there is hardly anything that can be done, except redoing. The thing is, when you visit a store, you may get attracted to those modern furniture or decorative elements, which is looking just awesome in the display. But when you pace the same furniture in your living room, it may not look that great because of the positioning, color scheme of your house or due to lack of space. But if you have hired an interior designer and consultant, they will design the look and feel and the piece of furniture for your home, as per the layout of the space, color theme and by keeping the functional need in mind. You can actually visualize the space and do alterations as needed, before placing an order or getting it custom built by the interior designers. A friend of mine has got a chandelier light for Rs. 36000.00 for her living room. And just after a couple of months, she is tired of it, because of the maintenance. Every time she wants to clean the light, she has to call a cleaner, because it’s too delicate and complicated to be cleaned by her. And you will be amazed to know, that she went out of her way and bought the light and had to compromise with the center table design that she liked. But ideally, it would have been wiser of her to get the center table done as per design and get the chandelier light that’s easy to maintain and of cheaper price than what she bought it for. Interior designers have wider network of vendors and they can make appropriate suggestion for kind of products and materials that is best for your budget and as per your needs. Similarly, they can help you with choose the right kinds of ply woods, laminates and other materials which best according to the use case, longevity and obviously something that fits right in your interior design budget. One of the other ways interior design adds value and helps you save money is by offering end to end services. Be it electrical, carpentry, plumbing and ceiling, when you hire a professional interior designer, they take care of everything. They have a wide network of suppliers and contractors who generally tend to charge discounted rates to the interior decorators. They have team for all kinds of job and they can be held accountable for the job they are undertaking. Same may not be the case when you hire an independent technician. How to find budget friendly interior designers in Kolkata? So now, as you have some idea about the cost of interior designing for 1/2/3/4 BHK flats in Kolkata, and know how hiring interior designers can help you save money and add value, it’s time to find competent and budget friendly interior designers in Kolkata. That’s exactly what we are going to discuss below. The easiest and best way to find interior designers and decorators in Kolkata or anywhere for that matter is to find from referrals. So if someone in your closed family or friend circle has worked with an interior designer, you can straight away review their work and ask to get referred to the contractor. Second best way to find an interior designer in Kolkata, Bangalore, Pune, Hyderabad and other major cities across India is to use ServiceSutra. You can simply submit the quote request form and tell us your requirements in brief. Once you create a request, our backend team will call you back within minutes to understand your requirements and then connect you to three of the leading interior designers in Kolkata or in the city where you need the service. You can discuss your detailed requirements and budget and get free quotations from all three of the interior contractors to evaluate and hire. Once you are ready to commence the project, you can directly hire the interior designer you would like to work with. Here’s a detailed list of questions you can ask an interior designer before hiring. It’s that easy and completely free. 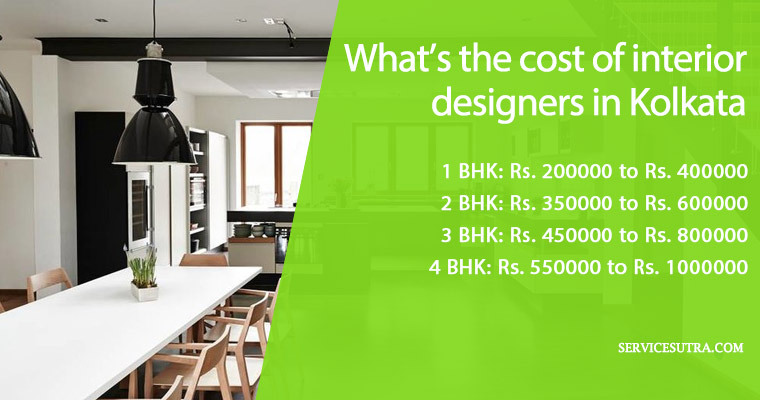 Over to you: what’s the best way to estimate the cost of interior design of flats in Kolkata? Interior designing is a cost intensive project and whether you are after 1 BHK, 2BHK or 3 BHK interior design project, getting some idea of the interior design cost can help you in many ways. If you are planning for interior design of a flat in Kolkata, then the best that you can do is to figure out a rough scope of work, and then talk to a couple of interior designers to get most accurate quotations for your interior design project. As you can see all of the costs mentioned above are in a range, and to get the exact and more accurate estimates, it would be wise to talk to interior designers directly. You can discuss your requirements in details, ask them to survey the property and then get formal quotations to complete the interior design project in your budget. They best way to hire an interior designer is to get reference from your friends and close family. But you can also use ServiceSutra to request competitive quotations and estimates from leading interior designers in Kolkata and rest of India for free. Have you ever worked with an interior designer? What do you think is the best way to find cost of interior design projects? Pingback: How Much Does an Interior Designer Charge in India?